Coin trays really come in awful handy sometimes. I realize that fact every time I take the turnpike somewhere – prior it was because I had to fish for change while slowing down and maneuvering into the toll booth, now because it’s so easy to grab two quarters and a dime for a $0.60 toll. Simplicity (and hot glue) at it’s finest. Originally the ends were supposed to just fold up nicely without a fuss, fitting perfectly, but the aluminum gets brittle with work and they broke off, so I Hot Glued it. I had to do some tweaking and fitting anyway (part of why they broke) as ‘close enough’ layout practices seldom produce a precision product. It took a bit of twiddling, but it eventually fit very well, as you can see. 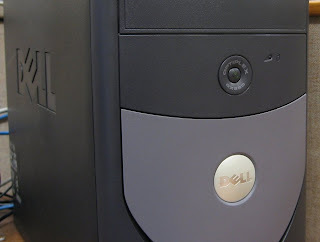 It’s just the right size so nothing can get lost back in corners without trying hard and the bottom is curved so you can scoop things out easily. Comfortably holds up to about five or six dollars in quarters & dimes. 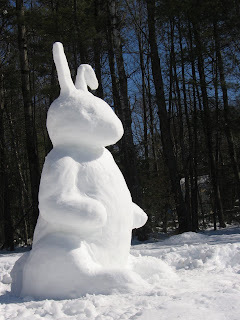 I just get crazy urges to make six-foot tall snow rabbits right before suppertime. Then I have to go back out after eating and finish the project before it gets dark and the weather decides to start alternately snowing and sleeting. I tell you the truth, it’s a rough life.